Here are some of our recent mobile friendly design projects. This website was redesigned to change the color scheme, give it a fresh look and also make it mobile friendly. The top navigation bar is fixed, so always remains on the screen even when visitors scroll to the bottom of a web page. 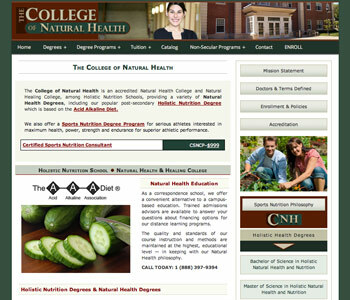 The links, registration form elements and buttons are touch-friendly. 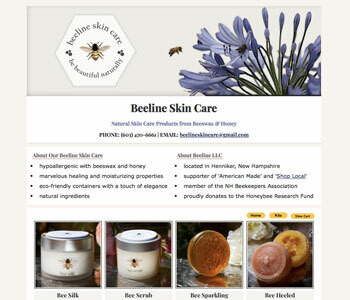 It is a simple process to find the skin care products and check out with PayPal. 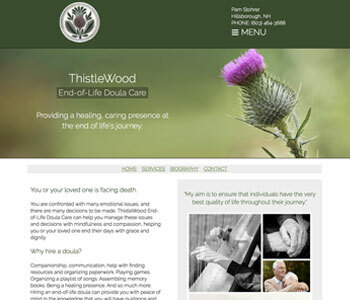 The owner of ThistleWood wanted a clean, minimalistic design for her End-of-Life Doula Care Website. She also wanted to include clips of her music as a Celtic Harp Player. The clean design with soft, delicate images was created in a way to be comforting for those seeking information in an effort to help a loved one end their days with grace and dignity. This website was created for a dog trainer. She wanted to emphasize that she uses humane, force-free methods to train dogs. The website includes a slideshow and a blog so this wonderful writer can tell her stories that show just how much she loves man's best friend. Visitors can subscribe to her blog. 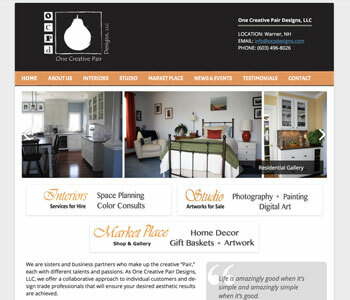 Two creative sisters became business partners and needed a website for their many services. The website has a lively, fun vibe and links to their online Etsy shop. They utilize their blog section for news, events and shopping coupons. 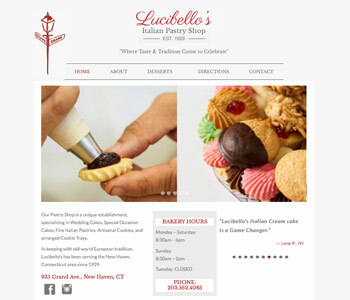 This website was redesigned for an Italian Pastry Shop in New Haven, CT. It is a responsive, minimalistic website with the photography grabbing most of the attention of the website visitor. 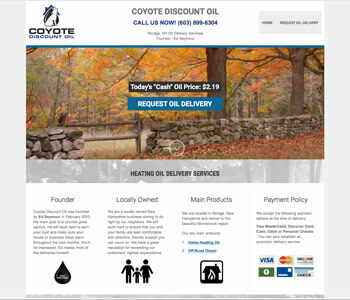 The owner decided on a WordPress site so that he would have the ability to update prices on his own. It includes a pastry gallery and wedding cake gallery. This website was redesigned for a small business owner who wanted to let customers know that he didn't just offer competitive prices, but more importantly great, reliable, friendly service. He also wanted to be sure that customers could reach him by cellphone and order a delivery of heating oil quickly and easily. So it was important to have a mobile friendly website. It also has some animation features. 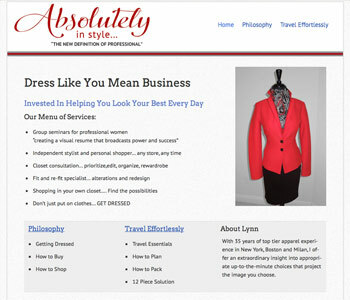 This website has gone through some major changes to keep up with the new services the owner was trying to incorporate. Easy navigation was important as the site was growing quickly. 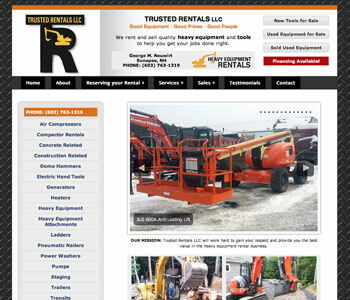 It was suggested to the owner that the site should be made friendly to those on mobile devices who may need to rent a piece of equipment spur-of-the-moment. They may be on a jobsite far away from a computer, but within easy access to a cell phone. Visitors can now rent a machine or tool from this company through their smart phone within minutes. This owner of this website received Google warnings that the website was not mobile friendly and requested a responsive design as a result of those warnings. This site was redesigned and major changes were made to the navigation menus to make the links easy to tap for those on mobile devices. The enrollment and contact forms were also redesigned to make them easier to fill out for visitors on cell phones and tablets. This website was designed for an image consultant. She wanted a clean, simple layout and easy navigation. 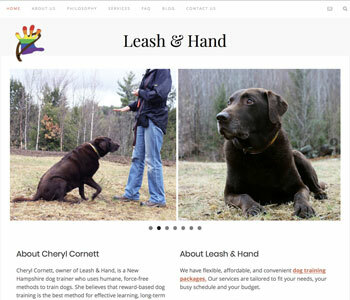 She also wanted her website to be easy to view on an iPad or mobile phone. The website was built with a WordPress admin section to give the owner the ability to make minor changes to the content on her own. Want to learn more? See What is Responsive Design?